The pleasures of a hot tub are, more or less, self-explanatory. It’s right there in the name. Whether you’ve got a Jacuzzi or a different model, it hardly matters – letting yourself soak comfortably in warm water as the jets supply a soothing pressure is a form of relaxation that few massages, spa treatments or holistic healing methods with essential oils can equal. And the best part of owning a hot tub is that, unlike a pool, you can use it year-round. If you have a back deck with a reasonably sized awning or other cover, you can be chilling out (figuratively speaking; you’ll in fact be warming up) in the tub even if it’s the middle of December and snow is falling! A faulty hot tub robs you of a reliable stress reliever. As such, when certain heating problems decide to rear their ugly head and prevent the proper operation of this appliance, it can be exceedingly frustrating. It means nothing less than the loss of one of the primary stress relievers in your life! Fortunately, troubleshooting the issues that may be bedeviling your hot tub isn’t terribly complicated, and several can be rectified with household tools. This might also spur you to think about alternative methods of warming up a hot tub, such as the use of a tankless water heater. More often than not, the reduction in warmth, or lack thereof, is attributable to an issue with the heating element. As explained by Hot Tub Works, this device is designed to operate while being surrounded by cool water, usually inside a stainless steel cylinder or chamber that’s often accessed by a panel along the side of the tub (though you should consult your owners’ manual to be certain). If water escapes the cylinder and exposes the heating element to the hot water in the rest of the tub, it’s a recipe for disaster – the part will burn out sooner rather than later. But if that aspect of the tub is in fine condition and you’re still experiencing heat loss, look at the element’s surface to check for scale. Households with particularly hard water or that have used salt-based sanitizers may find scale on their appliances, and the hot tub is no exception. You’ll probably need to replace the heating element, but they often cost $50 or less. 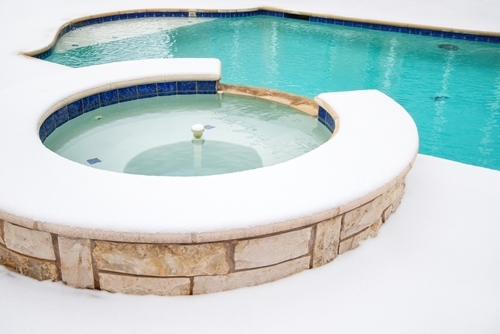 Like pools, hot tubs use filters to keep the water clean and free of various kinds of gunk. If they become clogged because you aren’t cleaning them regularly, this partially impedes water flow and thus contributes to heat reduction, according to Swim University. Typically, the part just needs a solid cleaning, but if you’ve let the issue go for quite some time, replacement might be necessary. If it’s the plumbing of your whole house that’s clogged, professional repairs are probably required. Swim University explained that a hot tub with a temperature wildly veering back and forth between warm and cool – which can be just as frustrating as a complete lack of heat – typically stems from a faulty heat sensor. A thermostat experiencing problems may also cause this to happen – or simply prevent you from adjusting the hot tub’s temperature as needed, which is only slightly less of a problem than heat fluctuation or loss. Finally, you must also remember to check the high limit switch, which stops a hot tub’s water from exceeding a certain temperature – just like cruise control in a car. If it looks like the switch is capping temperatures of its own volition, Swim University recommended resetting the part if possible, or waiting for excess air to leave the tub’s system after you’ve refilled it; that can sometimes cause the high limit switch to go off. If the problem remains unresolved, it’s time for the switch to be replaced. The same principle applies for thermostats and heat sensors. Electric tankless water heaters can serve as an excellent source of additional heat for countless home appliances, and hot tubs are no exception. But when certain problems arise, they can go even further above and beyond the call of duty: A tankless heater from Ecosmart can temporarily serve as the primary heat source for your tub while you figure out what’s going on with its various parts. Even when the tub is functioning just fine, you can lower its thermostat and turn up the tankless unit, so as to reduce the burden on the hot tub’s heating element. Due to its size, the average hot tub will probably use the Ecosmart Smart Pool 18 model, generating 18 kilowatts, as opposed to this heater’s 27 kw counterpart.